It’s not particularly heavy jacket weather here in New York City just yet, but it is Halloween season and if you want clothes that can double as a costume, this silly yet practical down jacket might be the apparel you’re looking for. The Matt Nylon Hooded Jacket, by Ai Riders On The Storm, is your average puffer, except with a zipper that goes all the way up your head with a goggle and air holes at the nose and ears so you never have to face the brisk wind … ever. 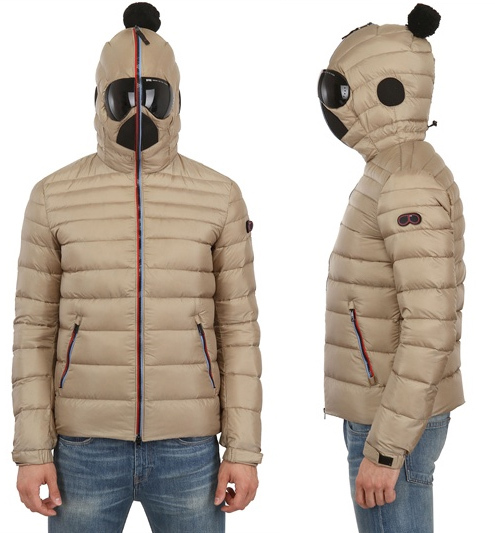 There are some practicality to this odd-looking down jacket. 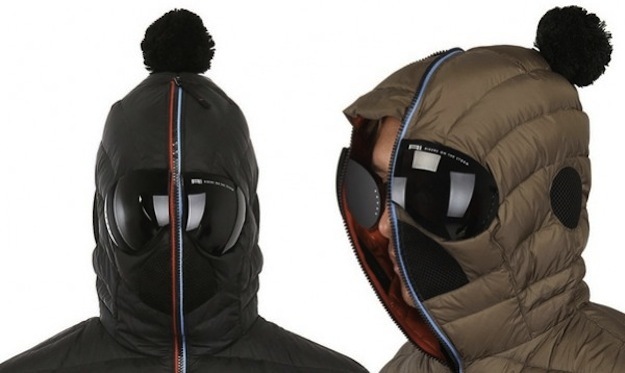 Obviously, winter sport enthusiasts will find the jacket a great accessory for avoiding snow in the face and thieves will use it to disguise themselves in a high fashion allure. Wanna look like a fly on the wall? Zip up the hoodie around your face and no one will want to come up to talk to you while you’re in your own world. It’s the best way to be emo without looking like one. If you’re not a fan of the black lens, you also have the option of switching to different colored ones to fit your day’s activity. Sold you on the look, didn’t I? Hold on to your bank account. At $424, the Matt Nylon Hooded Jacket is available in black or sahara/green which includes shipping. Thankfully, the pom pom is removable. Just remember that if you’re gonna wear this with the hood zipped up, be prepared for women to run far far away from you while hooligan kids try to hit you in the face with a snowball shower. At least you’ll stay warm!